Restaurant Concept: Pan Asian dining to suit any palette. Featuring authentic cuisine of Indochine (Vietnam), China and Japan with the freshest fish flown in daily. The innovative wine selection has become the industry vanguard. Offering a generous 48 wines by the glass carefully selected to go with the Chef’s menu creations. Private dining, banquets, cocktail parties and business meetings are available. Décor: Cool steel mixing with soft leather red velvet drapes fall to the concrete floor from 37-foot ceilings, dividing the 4500-square foot space into three different rooms for dining or lounging. As the evening grows, and the restaurant fills, the fluid boundaries become more defined. 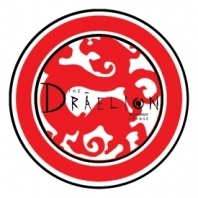 Menu: Draelion offers diners a 16-page menu – so lofty that it comes in a bound black leather notebook – featuring Vietnamese, Japanese, Thai and Chinese cuisines, including sushi made from fish flown in fresh each day. Every dish on the menu is paired with a suggested wine. Reservations: Reservations are encouraged but not required. Please call 214-219-6880. Information: For further inquiries, please contact Teel Tishgart 214-219-6880 or teel@thedrae.com. Or visit us online at www.thedrae.com.